How can New Zealand’s state legal system recalibrate to challenge the Crown’s assumption of sovereignty over lands and waters treasured by Māori? 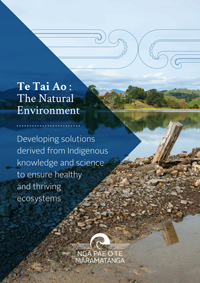 Drawing on the research findings of the other Te Tai Ao foundational projects, this project will lead to new laws, policies, plans and models for government and iwi/Māori communities, and will enable Māori to reassert traditional knowledge in governing land, water and resources to better enable flourishing Māori health, wellbeing and prosperity. Legal systems have the capacity to recalibrate and reflect the dreams and nations of the modern country. Indigenous law academics agree and argue that “different principles” are required “to judge Indigenous contributions because contemporary legal rules were developed within a cultural logic that erased prior Indigenous presence and ecological relationships”. There are now contemporary examples of considerable legal imagination evident in Aotearoa New Zealand. However, new understandings and challenges are paramount around substantive issues such as whether water is common or private property; how should Māori communities tackle climate change, resource extraction, carbon credits and emission trading; and how can we address related issues such as increasing demands for economic and employment security? This project accepts these challenges by specifically seeking to explore the transformation of existing law, policy, plans and governance models and working towards creative and innovative methods for enabling economic growth, fostering social and cultural wellbeing and vitality, and achieving environmental sustainability. Consider how Māori knowledge and laws can best be utilised to govern Māori owned land and resources, and how law, policy, plans and models can be reformed to embrace these opportunities. Understand how Māori knowledge guides Māori decision-making for balancing sustainable use of land and resources and how law can be reformed to embrace these opportunities. Explore how law, policy and plans ought to be recalibrated to support continuing Māori desires to own and/or govern currently assumed or asserted Crown or publicly owned lands and natural resources (e.g. lands within national parks, minerals and freshwater).